Sleep is important for optimal physical and cognitive development among our furry friends. Sometimes, even behavioral tendencies such as irritability and aggressiveness are the consequences of the lack of quality sleep. As dog parents, the responsibility in ensuring our pets have the best sleep every time falls on our shoulders. Start by giving them the appropriate sleeping bag. 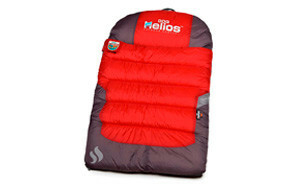 Yet don’t fall into the trap of buying the sleeping bags based on price. Not all expensive dog items are the best options for your pups since their sleeping needs differ across breeds, body builds, age, and personality. You’re lucky to have landed on this page. We’ve surveyed the market to give dog parents like you the top 5 best dog sleeping bags to guide your purchasing decision. RUFFWEAR’s Highlands is one of the best dog sleeping bags you can ever get as it comes with a reliable design and construction that anchors on the use of premium-quality materials. It may not be the kind of dog sleeping bag that will get your pet warm and cozy in Arctic conditions, but it sure can protect your pet when it comes to hard and cold surfaces. The synthetic material used in the Highlands pet sleeping bag is perfect for delivering just the right levels of protection against the cold while its soft and cozy interior is never going to irritate your pet’s skin. The RUFFWEAR Highlands sleeping bag for man’s best friend comes with the right fit that should be cozy and comfy for smaller dogs, although some pet parents can easily fit their hounds into the 35 by 26 inch synthetic cavern. You will just have to measure your dog if it fits well within these dimensions. If you do wish to use the Highlands in extremely cold surfaces, you can still do so provided, however, that you also get another pad to help increase the layer of thermal protection for your pet. Otherwise, the Highlands should be a really neat, comfy, and warm contraption for your dog to sleep in whether it’s outdoors or indoors. It’s not really a dog or puppy sleeping bag that can cover the body of your canine friend, but this Chuckit! 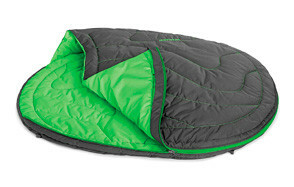 creation happens to be one of the best dog sleeping bags in the market. Everyone knows that Chuckit! is best known for its Chuckit! toy balls and launchers that are well-loved by pet parents and their dogs alike. The same careful attention to detail the brand puts into the design of their doggie toys is also very evident in the Travel Dog Bed. Featuring a poly-suede surface that gives your pet the kind of comfortable softness it needs whenever it’s time for a quick nap or a more restful sleep outdoors, this dog sleeping bag bed is perfect for any outdoor adventure you may have in store for your four-legged friend. It comes with an inner liner that is not only water resistant but also features rip stop capabilities. The double offset quilts also afford a nice touch to the overall design of the Chuckit! dog sleeping bag. You can always feel safer with the fact that Chuckit! 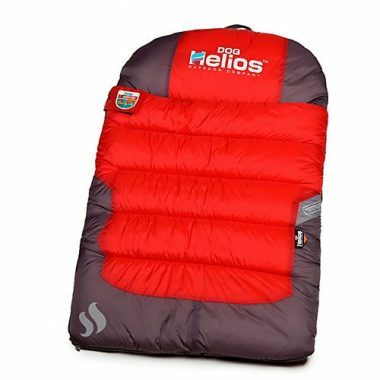 uses premium quality nylon fabric in the construction of this pet sleeping bag. There’s only one size for the Chuckit! though – 39 by 30 inches. However, it should keep your hound warm and cozy whenever the ground or floor is unbearably cold. 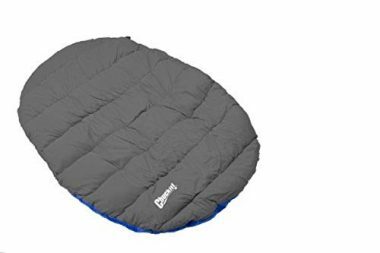 Whereas other dog and puppy sleeping bag contraptions are designed just like your ordinary human sleeping bag, the Ozark Trail dogsleeping bag is quite ingenious, to say the least. It’s not your typical pet sleeping bag since it comes with a boxy design complete with four high-enough sides that are made of extra-thick well-cushioned panels that should keep your dog cozy, warm, and comfy inside its weather-tough shell. Just imagine a box that opens on top. 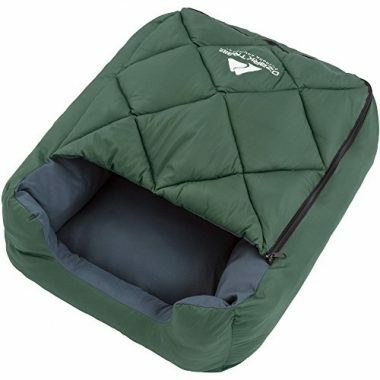 Now add really thick padding that is made of pet-safe and durable materials on all five sides of the box (except the top) and you’ve got the Ozark Trail dog sleeping bag bed. No wonder folks in the dog-loving community call it one of the planet’s best dog sleeping bags since it provides ample interior space for your pet to move. This is way unlike other products that, once the zipper closure has been fully engaged, can make for a really comfy den. Do take note that the Ozark, as wonderfully designed as it is, is not really intended for freezing conditions. However, if you’re heading off to a chilly camp the Ozark Trail should be well worth it. At the very least, you can be sure that Bongo will have a really restful night in the woods or even in your backyard. This pet sleeping bag from SPOT is not only a comfortable pet cave bed for your furry pal, but also a very durable contraption that will have your dog sleeping in no time regardless of how cold it can be outside. The fill is made of 100% recyclable material giving the Ethical Pets dog sleeping bag a level of eco-friendliness that should appeal to those who are conscious about the impact of their choices in the environment. Sadly, the Ethical Pets is designed to accommodate only smaller pets weighing not more than 10 pounds. We share the sentiment of some pet parents in saying that the SPOT dog sleeping bag bed may be too small for some ‘small’ breeds. Perhaps a teacup sized Chihuahua or a Yorkie should able to fit right in. It’s more like a modified version of a dog bed because of its den design. Nevertheless, this den-like contraption sure can keep any small dog fuzzy and comfy in the coldest of weather. The interior is not only stylish, but also soft and comfy. It has ribbed faux finish that is guaranteed to further increase the level of comfort that dogs feel whenever they snuggle and cozy up in the den. This small dog and puppy sleeping bag comes with a recycled fill that will never clump or shift even if you throw it in your washing machine. As already mentioned, we lament the fact that it’s very small. This limits its usefulness to dogs that can fit right in. It’s too bad for owners of medium or larger dogs; good for those with toy breeds. Designed just like a human sleeping bag but with the added versatility, the DogHelios Trail-Barker Multi-Surface Travel Dog Bed is one of the up and coming best dog sleeping bags worth your consideration. With a few minor hiccups such as unreliable zipper closure mechanism, the Trail-Barker easily makes its way as a great dog sleeping bag. Available in 4 different colors that should match well with your other camping and outdoor gear, the Trail-Barker easily rolls into a conventional pet sleeping bag, secured by heavy-duty straps that will surely keep it in place. Attach it to the rest of your camping gear with its integrated loop or let your dog carry it on its back. It weighs only 3 pounds anyway. The Trail-Barker’s main selling point is its expandability. The full-length zipper system can be connected with other Trail-Barker dogsleeping bag bed contraptions to give you a much larger comfortable and warm sleeping area for your household-full of dogs. The fabric used in the Trail-Barker is exceptionally thick and has been rated to give warmth or comfort to dogs at minus-15 degrees Celsius or roughly 5 degrees Fahrenheit. On top of the elegantly quilted design of the Trail-Barker is a water-repellent coating that is made of premium polyurethane. It’s a comfy sleeping contraption for Ringo whenever you head outdoors. Why are Dog Sleeping Bags Necessary? Whether it is camping, backpacking, hiking, trekking, or mountain climbing, or just about anything that you can think of whenever we’re talking about outdoor activities, you’d want your pet to feel safe and comfortable during the entire time that you’re outside the comfort, security, and safety of your home. And when it comes to safety in camping, one of the most essential gears that every outdoor adventure-minded individual has is a sleeping bag. If you deserve a good sleeping bag to protect you from the bitter cold of the wilderness, don’t you think your dog deserves to have the best dog sleeping bag, too? While some dog breeds are naturally adapted to cold weather environments such as the descendants of Nordic and Arctic dogs, there are still some dog breeds that are especially susceptible to extreme cold temperatures. If you think that the environmental temperature is unbearably cold, what more to your dog? This is the fundamental reason why dog sleeping bags are necessary especially when camping or sleeping outdoors where the environmental temperature cannot be controlled. This is very different from your air-conditioned room where you can easily adjust the thermostat to make it a lot warmer and more comfortable for your pet. There are no such thermostat controls in the wilderness, so you and your dog are often at the mercy of the elements, so to speak. Your dog may not experience frost bite, but being exposed to cold temperatures for prolonged periods of time can also have negative effects on its health. If their body temperature gets to substantially low levels there is a possibility that the dog’s heart rate as well as breathing can slow down. This disrupts the efficient flow of oxygen and nutrients as well as other substances throughout the dog’s body. 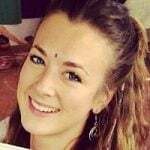 If blood is not circulated to the brain neurological problems can arise which can include confusion, hallucinations, convulsions, seizures, decreased level of consciousness, and coma. If it is the muscles of the heart that are no longer receiving adequate blood this can lead to heart attack. If it is the kidneys that are no longer being supplied with blood it can go into urinary insufficiency before developing into kidney failure. Using dog sleeping blankets can help minimize your dog’s exposure to extreme cold and help prevent the development of hypothermia. While not all camping adventures will instantly lead to hypothermia, it is still best to take the necessary precautions. One of the things you’ve got to consider whenever picking a sleeping bag for your four-legged friend is the type of sleeping bag for canines. Unlike human sleeping bags, these especially-designed sleeping contraptions for man’s best friends can come in different shapes and sizes. Doggie sleeping bags are generally designed to cater to the sleeping habits of dogs. There are those that love to curl up whenever they sleep while there are Ringos that feel a lot more comfortable with their four legs stretched out towards the side. And then there are dogs that can remain perfectly still throughout the duration of their sleep while others tend to be as ‘active’ in bed as they are during the waking hours. Here are some of the more common styles or types of dog sleeping bags that you may want to know about. 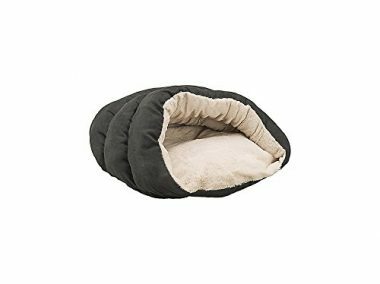 This is perfect for dogs that are more accustomed to sleeping in a cave-like contraption. It resembles a burrow or perhaps even a house. But since it’s a doggie sleeping bag you can expect it to resemble more an igloo sans its lengthy entranceway. It is perfect for curlers or for dogs that love to sleep all curled up. The ‘roof’ of the den or cave provides adequate protection from the cold air while the enclosed sides and bottom keep your pet warm and comfy. This is a lot similar to a donut type of doggie bed, except that this has higher sides. It’s like a nest type of doggie bed that is ideal for pets that also love to curl but absolute hates the cover afforded by a top layer of fabric. As the name implies, this type of dog sleeping bag is perfect for canines that prefer to sleep fully stretched out. This means they don’t curl up so they will use the entire space afforded by the dog sleeping bag. These technically resemble the sleeping bags that we humans use. This style of dog sleeping bed is a lot similar to the cup style. The only difference is that it has much thicker sides or walls as well as bottom to make it extra-comfy, cozy, and warm for your dog. Like the den or the cup style of dog sleeping bag, the pod is also intended primarily for pooches that love to curl up whenever they’re sleeping. This style of dog sleeping bad is quite unusual, but there are companies that obviously manufacture such types of products. It’s called a dog sleeping bag bed that is more a combination of a doggie bed and a cover that serves more like a blanket or even a bed cover. Learning the different types of dog sleeping bags should already give you a rough idea on what product you are going to buy for Fido. Suffice it to say, this is often not enough, of course. You will still have to check other factors that might have an impact in the safety and comfort of your pet using the dog sleeping bag in the real world. Here is a list of the important things that should always be considered when buying a doggie sleeping bag. Obviously you want something that is slightly bigger than your hound. This somehow depends on the sleeping behavior of your dog. If Fido loves curled up when sleeping, then you can always go for a smaller size of sleeping bag. But if Bongo loves sleeping sprawled then choosing a much bigger or larger dog sleeping bag is a must. Always allow at least 6 inches of additional interior space for your pet to move about. For example, if Fido is about 26 inches long, then you should go for a pet sleeping bag that is at least 32 inches long. You will need to consider the location where you’re going to place the dog sleeping bag on. Will it be over rocky surfaces or will it be grass? Is it sandy or muddy? If the ground surface will have lots of twigs, pebbles, or even rocks it is imperative that the bottom layer of the dog sleeping bag be made of extra-thick fabric complete with ample padding. 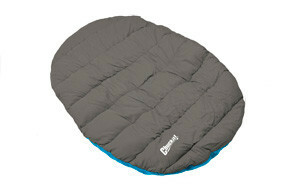 Alternatively, you can also bring extra sheets of towels or even a portable dog bed to go inside the sleeping bag. If it is grassy, then moisture- or water- resistance is a must as it can get dewy especially at dawn. If you’re heading into really cold environments it is often imperative that you check the weather rating of the dog sleeping bag. Just because it has a thick shell doesn’t necessarily mean that it can already be used in freezing conditions. Make sure there is a heating element or at least thermal insulation layer built into the design of the dog sleeping bag to help keep your pet comfy and warm. But, of course, if you’re not going camping in freezing conditions, then there is no need to look for such a feature. Sleeping in the wild means you’re technically at the mercy of Mother Nature. And unlike your thermostat-controlled home, there’s no way you can tell beforehand if Mother Nature is going to unleash her fury once you’ve set up camp. As such, the doggie sleeping bag should also have excellent weather protection. Perhaps, the most important thing here is to never go out whenever you expect a storm. But then again, nature can be very unpredictable. It is always best to stay prepared rather than be sorry later. 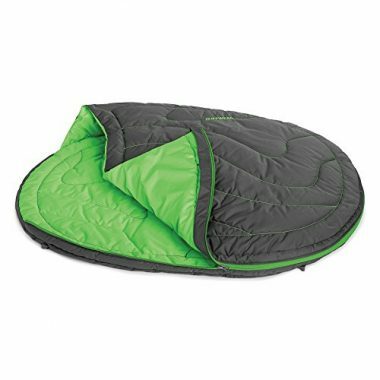 Getting a dog sleeping bag that has exceptional weather-resistance and water-proofing can go a long way. Take note of the construction of the closure system. Most pet sleeping bags come with zipper closure. Unfortunately, some are haphazardly constructed that a single zip of the closure is all it takes to damage the entire system. Always look for products with reliable hardware. Unless you’re going to train your dog to carry its own camping gear, you’re most likely the one who’s going to carry the dog sleeping bag. And if you already have a lot of stuff on your back, you don’t want another heavy item to weigh you down. Q: What size of sleeping bag should I get for my dog? A: You should always measure the size of your dog to have an idea of the size of sleeping bag that you’re going to get for your pet. Look at how they sleep and try to measure them in their natural sleeping position. Basically you will be measuring the area that their bodies occupy when they are asleep. You will then need to add an allowance of about 3 inches on all sides of the measured dimension to allow for movement inside the sleeping bag. For example, if Fido is a curler and will typically take an area of 18 inches long by 15 inches wide to sleep on, then the minimum dimensions of the sleeping bag should be 25 inches by 21 inches. Q: How do I get my dog to use the sleeping bag? A: Training your dog is important if you want it to be comfortable with its sleeping bag. But if your dog has been sleeping in a doggie bed, it shouldn’t be a problem getting your hound to love the sleeping bag as well. First, acclimatize Bongo to the sight, scent, and feel of the sleeping bag. Some dogs don’t even need acclimatization at all since they already know what they should do. But for those who don’t, it’s imperative that they be eased into the presence of the sleeping bag. You can throw your dog’s favorite doggie toy onto the sleeping bag or entice it to go there with a treat. It’s like crate training, except that this time you want your pet to use the sleeping bag. Time your training sessions to coincide with your dog’s sleep routine. This way it will learn to associate the sleeping bag with rest. 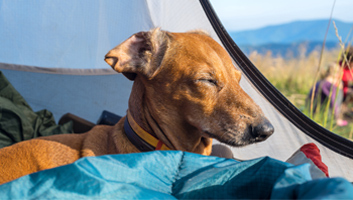 By the time your dog is already accustomed to sleeping on the bag, you can then try moving the sleeping bag outdoors. Do it slowly and gradually. Q: What if my dog has anxiety? A: If your dog has anxiety you can give it its favorite toy. There are a number of doggie toys that are designed to relieve a pet’s anxiety by diverting its attention and focus from whatever is making it anxious to something more productive. You can also give it dog chews that will typically last several days. Again, this can take your dog’s mind off the anxiety-inducing event or thing. Puzzle toys are also preferred as these can keep dogs preoccupied. Massaging your dog just before it goes to sleep also helps. This can help promote relaxation and help alleviate anxiety. Taking your dog for a good run at the campsite can also dispense of that excess anxious energy so it will be able to sleep sooner and sounder, too. You can also try playing soothing and relaxing classical music. It has the same calming effects in dogs as much as it does in humans. If nothing seems to work, you can try anxiety-relieving dog vests. You can also ask your veterinarian to prescribe anti-anxiety medications for your pet. Lastly, it is also important to check your own anxiety levels. We have this tendency to rub our negative energies onto our pets. Dogs can become so anxious if their pet parents are also very anxious. Not everyone may agree with the need for a dog sleeping bag. However, these contraptions are important in making sure that our dogs not only feel comfortable when we are temporarily living in the wild, but will also ensure their safety.